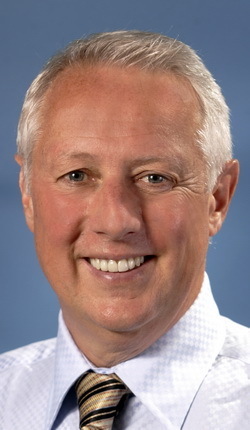 Hotel Lawyer: ALIS brings optimists to earth. Lenders make new evaluations. Realism is cold and gray. “Realism” was the defining word for the ALIS conference held in San Diego on January 25-27, 2010. ALIS attendance was roughly half or less of last year, and the experts officially declared 2009 one of the worst years for the hospitality industry. They have already thrown in the towel on the industry for 2010, and look to an anemic 2011, with double digit growth in RevPAR after that . . . but we are so far down the hole now, that even double digit RevPAR growth will take years to reclaim the levels enjoyed in 2005-2007. So what does this portend for lenders? And what is the smart money doing now? 2010 is already in the can — the trash can, that is. Even the most optimistic industry experts have given up on any improvement for the hotel industry in 2010. The only question is how bad it will be. We used to think that changes in GDP were the most accurate indicator of performance in the hotel industry, but recently it appears that employment or unemployment is a better indicator. 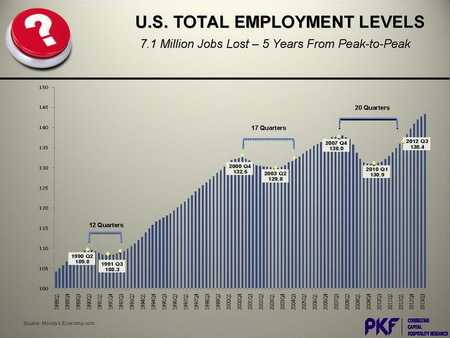 Unfortunately, as Mark Woodworth of PKF Consulting showed in these slides, the jobless recovery will take a long time to recover to 2007 levels. 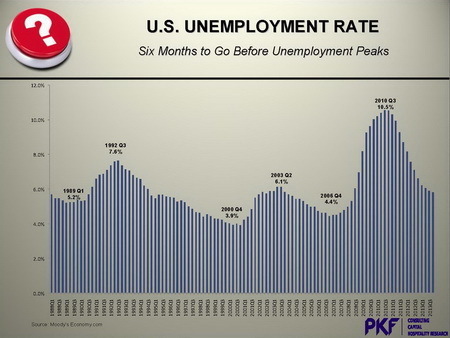 And, as the hotel industry lags employment, relief for hotel lenders and owners is still a long way out. From data presented by the experts, it looks like the best scenario will be RevPAR declines of -3.5% to -5% for 2010, and RevPAR increases of 1.5% to 4% for 2011. The effect on income from these RevPAR declines at current occupancy levels is roughly 2 to 1, i.e. a -5% RevPAR decline likely translates into a -10% revenue decline. Cap rates have increased at least 200-300 basis points for hotel valuations since the Crash of 2008, and some would argue more. It does not appear these rates will be coming down any time soon as hotels have fallen into disfavor as a real estate investment class. Therefore hotel valuations will continue to feel the effects of falling NOI and flat or declining cap rates for some time. 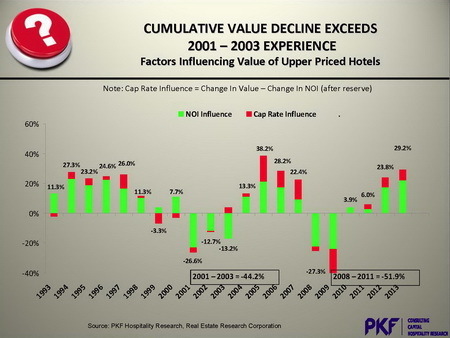 Here is a projections of hotel valuations from PKF, which we regard as an optimistic view. From current lows, little impact will be noticed — even from these projections — until 2012 or 2013, and those increases will only begin to move the needle from current levels. What does this mean for lenders and owners? We think lenders and owners have finally gotten the message: things are going to get worse for at least another year or two before there is a turn around. Improvement in the 3rd quarter of 2011 is not going to help anyone very much today suffering with debt service or operating deficiencies. In fact, here is PKF’s projection of hotel loan delinquencies. Maybe it’s the tide of troubled hotel loans rising or maybe it’s the dreaded realization that present values are falling — and will continue to fall for some time. But it seems that more lenders are now moving into action on troubled hotel loans. We have a 10 year supply of hotels on the market at the present absorption rate — and that assumes no other hotels are put on the market. It is “highly unlikely” that more hotels will not be put on the market. Reay says, “If you don’t like the market price today, you are really not going to like it 12 to 18 months from now.” Basically, Alan sees that sellers have been looking for “yesterday’s prices” and by the time they reconcile themselves to the price they were offered 6 months ago, that is no longer achievable. If you would like to speak directly with Alan Reay, he can be reached at (949) 622-3409, alan@atlashospitality.com or www.atlashospitality.com. It looks like that was great advice then, and still is now. What happens to the present value of your hotel or collateral in a market where fundamentals continue to erode for a year or two, recovery will take years, and investors continue to add longer hold periods in order to realize any gain? Don’t the holding and carrying costs exceed the incremental additions to value when those increments are small and pushed out over 5 to 10 years? Do you want to take a chance? We think the photo below says it all. 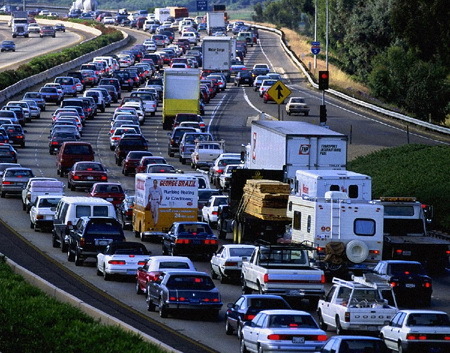 Sell now and avoid the traffic jam! Sell now and avoid the traffic jam! What do the hotel lawyers at JMBM’s Global Hospitality Group® advise? Do the math yourself! Run a present value analysis of likely cash flows on 3 alternate scenarios. Decide whether you have the stamina and capital for a long haul if you intend to hold. Or decide that you are a gambler. Be realistic. And if you are going to be a seller, then sell quickly. Many experts see values continuing to decline until at least 2011 or, more likely 2012. Some think values recover peak levels by 2014 and others think recovery to 2007 levels is TWO real estate cycles from now (given that a typical hotel cycle lasts 7 to 8 years, this could possibly be 10 to 16 years, i.e. 2019 to 2025). We would be happy to help you evaluate your options and develop the best plan from here.